Leyard and Planar today introduced the Leyard VersaLight Series, according to the company “a highly versatile family of LED video wall displays that can turn even the most challenging environments into dramatic, inspirational video walls.” The new modular line of indoor and outdoor LED digital signage displays offers stunning picture quality and ultra-reliable performance in a variety of pixel pitches—from 2.5 to 8 millimeters. The Leyard VersaLight Series makes it easy to turn creative design ideas into spectacular video walls—with a self-contained modular structure that can be modified to fit users’ unique needs. The compact displays can be combined into multiple sizes and shapes, bringing custom LED video wall designs to almost any space, no matter how challenging. The self-supporting, quick-align frames are easy to install and provide a wide variety of flexible mounting options. 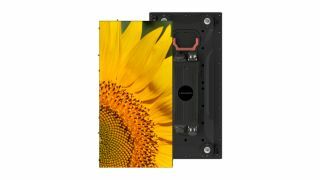 They can be hung or mounted on a wall or ceiling, stacked as a self-standing video wall on the floor, and even mounted directly to frames designed and customized for a specific installation. These features make the Leyard VersaLight Series extremely versatile for a wide range of indoor and outdoor applications—from non-traditional ceiling displays to temporary outdoor staging applications. Highly versatile designs: Leyard VersaLight Series displays are 240 millimeters wide by 480 millimeters tall (9.4 inches x 18.9 inches), offering a compact design that can be tailored to a wide range of indoor and outdoor applications. The interlocking die-cast aluminum mounts are available in one-by-one (1x1) and two-by-two (2x2) configurations, making it possible to build video walls of nearly any shape and size. Flexible mounting options: The Leyard VersaLight Series offers a wide range of mounting options, allowing for video walls to be hung, mounted to the wall or ceiling, stacked above the floor or mounted directly to customized frames. Optional quick-lock hardware is also available for fast-up, fast-down installations. Each Leyard VersaLight Series cabinet is a self-contained unit that can be combined into large video walls or used individually in space-constrained spaces. Stunning picture quality: The Leyard VersaLight Series is offered in indoor configurations of 2.5, 4 and 6 millimeter pixel pitches and outdoor configurations of 4, 6 and 8 millimeter pitches. The product also offers excellent brightness and black levels for high ambient light environments. Reliable 24x7 performance and status monitoring: The Leyard VersaLight Series is designed to support 24x7 operation and employs a fast, modular service capability. The series makes it possible to monitor the health status of all video wall components from a central location—automatically identifying non-functioning displays, power supplies and electronics in real time so customers can proactively troubleshoot their video walls and take corrective action. Front access installation and service: The Leyard VersaLight Series can be installed and serviced from the front, eliminating the need for rear access, freeing up valuable space and simplifying maintenance. The Leyard VersaLight Series will begin shipping in Spring 2018 through Leyard and Planar’s worldwide network of authorized resellers. It will be showcased at Leyard and Planar’s booth at Integrated Systems Europe 2018 (Stand #12-H80).